If I took a look in your kitchen right now, would I find some recipe books? How about in your hobby closet. Would I find knitting or sewing patterns? And in the garage? I bet I'll find a maintenance schedule in your car. We rely on these kinds of instructions every single day, and with good reason. Following a step-by-step plan makes us more efficient, wastes less time and money, and helps make sure dinner tastes good and the car keeps running. But if I took a peek behind the curtain of your business, would I find clear instructions? Or would you say, “Oh, I just know what I need to do and I do it”? Sound scary and over-dramatic? It's really not, and here's why. You'll save hours of work every week. Seriously. When you no longer have to spend 3 days waiting for your website designer to tell you the hex codes for your logo colors, or wait 20 minutes for that password reset email to show up (again), you'll appreciate the time-saving benefits of business documentation. Documentation also provides a better customer experience. A simple checklist can prevent embarrassing mistakes like sales page buttons that don't work, coupons with the wrong expiration date, email links that go nowhere, and any number of other things frustrate your customers. Maybe the biggest benefit of a properly documented business, though, is the peace of mind you get. What if you couldn't work for several days or more? Could you easily hand off mission-critical tasks to someone else? Unless you have documentation in place, the answer to that is a clear no. Why do we resist getting this crucial business task done, then? Maybe because we've made it out to be more difficult than it truly is. In a past life (pre-internet), part of my job was ISO 9001 compliance. In plain English, that means I was responsible for maintaining all the policies, procedures manuals, and work instruction documentation for the small factory where I worked. We had thousands of pages of checklists with unique identification numbers and related worksheets and required training documents. They all lived in a complex series of nested folders several levels deep, which felt really organized, but navigation was a chore. When I started my own business, I knew I needed to document my systems. I saw the benefits of that, but I thought good workflows meant creating complicated document control systems like I'd learned in the corporate world. You're (probably) not making automotive air bags or antiviral medications or anything else with life-or-death consequences, so there's no need to get hung up on things like revision control. It will just add another level of resistance with little to no value. Makes sense for the way you work. If you love Wunderlist or Evernote or Asana, then adapt your documentation to those tools. Don't force yourself to learn a whole new system, because you likely won't do it. Is easy to share with a team, because if you don't already have an assistant (or two or three) then you will someday, right? Documentation that exists only in handwritten form in a notebook on your desk is not shareable. Put those checklists and worksheets into pixel form and get them in the cloud where your team can access them, too. Makes your job easier and more efficient. Clicking through 17 levels of folders in your Dropbox is not a good use of your time, and trust me when I say, you won't do it. Documentation should save time, not make more work for you. With all that said, simply creating systems won't win you any entrepreneurial kudos. You have to actually use the documents you create. Before you know it, your blog post formatting is chaotic and off-brand, you accidentally overpaid your team because you were looking at last month's numbers, and no one can buy your latest training because you didn't add the link to the sales page. If you outsource, make sure your all your team members have access to the documentation they need as well. It will save time and frustration for everyone, and make for a far better customer experience as well. As you perform each task, jot down the steps you take on a Word document, in Google drive, Evernote, Wunderlist or anywhere else you can add a simple checklist. Viola! You've just documented your first business system! Wasn't that easy? Option 1: Outsource it. If you already have a team member who is responsible for performing those tasks, make it his or her job to also create the documentation. Option 2: Start with a done-for-you template like this one from Cindy Bidar. 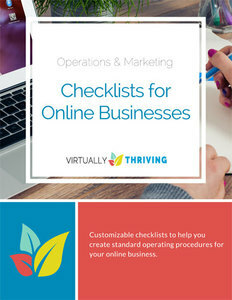 These 24 online business marketing & operations checklists + 8 documentation templates, and the bonus business operations manual template is the perfect start for your Standard Operating Procedures manual, and you can have it set up in minutes. Get your copy here, and save $10 when you use promo code PIGGYPERKS in the cart.